Hi guys! In this post I'm talking about my 5 essentials for being productive. I think this came at a perfect time because I made some goals for myself this year. Before I share them with you, I am going to tell you a little bit about Kabbage. Their an online provider of small business loans. They are a great place to turn to if you're looking to start a business and/ or looking to keep your business on the right track! Be sure to check out their "4 ways small business owners can boost their productivity" here: Community page. 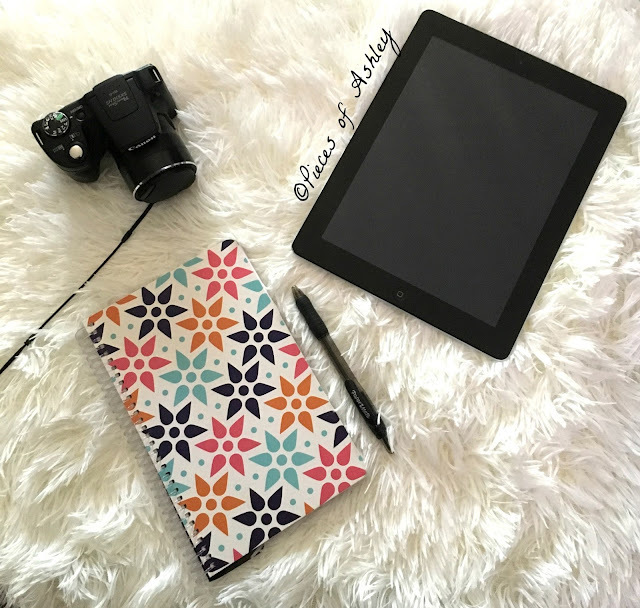 So here is my list of 5 essentials that keep me productive! - Make goals for yourself. Whether it's daily, weekly, monthly. and even yearly goals. In my opinion goals are important, because they help you reach things you want to accomplish. I have a lot of goals I want to accomplish, and I feel like I already started to. - Plan a to- do list. Making a list of things you want to achieve throughout the day or the week are a great idea. A to- do list keeps you on the right track of staying organized. I will admit that procrastination was one of my obstacles in the past. I actually worked good under pressure. But I realized that if, I wanted to accomplish my goals and get to where I wanted to be in life I would have to stop procrastinating. Even though I worked good under pressure, it left me feeling stressed and that is not a good feeling. Staying organized and knowing what I want to get done during the day has helped me a lot. It keeps me focused and grounded! - Keep a journal/ notebook. The brain is a powerful thing, but we are not able to remember everything. That is why keeping a journal or a notebook is great idea. You can put all of the things you want to do and have to do. So if you forget, you can easily go back to the book and remember! You do not have to invest in an expensive notebook, unless you're fancy that way! They range anywhere from $1 to $10. Just think of it this way, your journal/ notebook is an organizer for your thoughts! -Distribute your time wisely. Especially on social media, it's easy to get off track because social media can be addicting. Instead of being on social media for hours, here's what I do. I go on in the morning, the afternoon, and the evening. I try to stay on for about 30 minutes, unless it's a bloggers chat which lasts for an hour! I will admit that on the weekend I get a little carried away. But hey who doesn't. As long as you use your time wisely, you shouldn't feel like you wasted a day. Keeping a journal will also help you organize your time! - At some point in time everyone has doubted themselves. Honestly I am guilty of it, I don't give my self enough credit. In the past I have given up to easily, but for almost 3 years blogging is something that I've kept going! Not to sound cheesy, but I feel like this is my year. Actually it's every ones year to achieve their dreams and become successful! - It's very important to make time for yourself. Everyone needs to take the time and relax. Relaxing helps you to reenergize and get focused again. Having your own me time is what everyone deserves. Whether it's for 30 minutes, an hour or 2. I like to read magazines in my me time. People and Us magazine are my favorites! I also like to listen to music and practice sketching clothes. - Treat yourself to a spa day. Better yet create your own spa day, in my opinion it's more fun! I really enjoyed writing this post and I hope you have enjoyed reading! Nice post. I agree that making time for yourself is important as we all need time to destress and pamper ourselves.